There comes a time in every young man’s life where he must air out all grievances in freestyle rap format, record it on his iPhone, and email it to Charlamagne tha God. 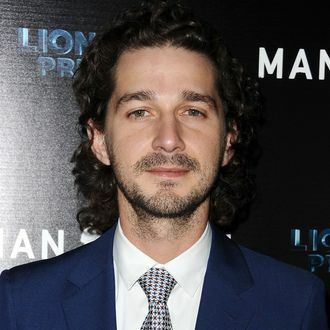 Or maybe that’s just Shia LaBeouf? For some reason, this morning LaBeouf sent Power 105.1 a full four-minute diss track with instructions to be played on air, which, obviously, they did. There’s a real method to the madness here: Earlier this month, Shia went on live radio on Sway in the Morning, freestyled for his life, and did not do so bad, you know, for someone who is not a rapper. But just the surreality of it all (and maybe a little jealousy) prompted fellow white non-rapper, Hot 97’s Peter Rosenberg, to drop a parody freestyle. It’s all very NYU dorm-room rap battle circa 2004. Never one to have his “art” made a mockery, LaBeouf’s response goes for the jugular: “I’m not a rapper,” he begins, so you’ve been warned. He then proceeds to stink out the rap room (and Hollywood) by out-Jewing Rosenberg (“both caucasian, both Jewish, I’m a cajun”), then coming for Drake’s appropriation (“faker than Drake’s Jamaican accent”), Lil Yachty again, Jean-Claude Van Damme, and even Vin Diesel ("I’m Steve McQueen, you is Vin Diesel”). Vin Diesel! No one’s safe when MC Shia’s on the mic – especially when using someone else’s pen.